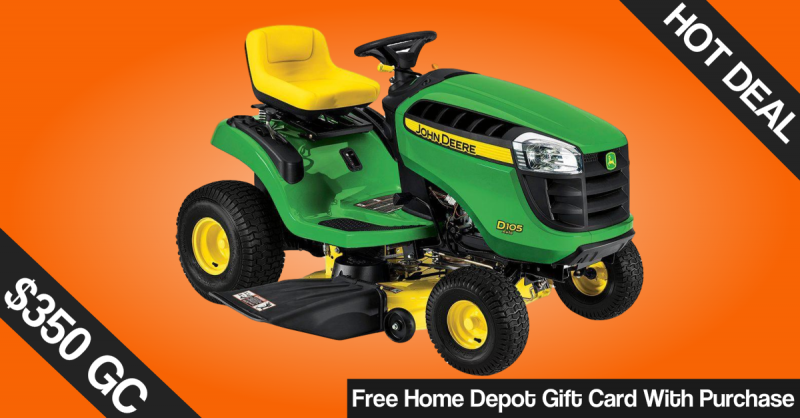 For a limited time you can get a Free Home Depot Gift Card worth up to $350 with select John Deere purchases at The Home Depot. 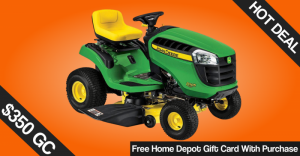 The value of the Home Depot gift card is determined by the model of the John Deere Tractor or Zero-Turn mower that you purchase. Gift Cards values could be $150, $250 or $350 depending on the model. You can check this in the chart below. The offer is good for Online or in store purchases, though the Gift Card will arrive via mail-in-rebate.